With longer production cycles, maintaining a healthy liver is crucial for hen performance. Liver health is strongly linked to egg mass, eggshell quality, and persistency in lay. Veterinarian, Rafael Lera, explains more. With the egg industry facing challenges such as significant population growth, the food/feed/fuel conflict, and an increased commitment to animal welfare, longer production cycles are important in ensuring egg production is profitable and sustainable. More and more breeding companies and egg producers are raising their birds for longer production cycles. The lay persistence in the first 70-80 weeks of age can only be improved to some extent. Most production improvement is accomplished by improving the lay persistence thereafter. As production cycles are lengthened, keeping a healthy liver becomes crucial for obtaining good performance. The reason for this is that liver health has a strong influence on egg mass, egg shell quality, and persistency in lay, especially as the birds age: the older birds become, the more egg mass they have produced, and the more challenging it is for the liver to keep healthy. 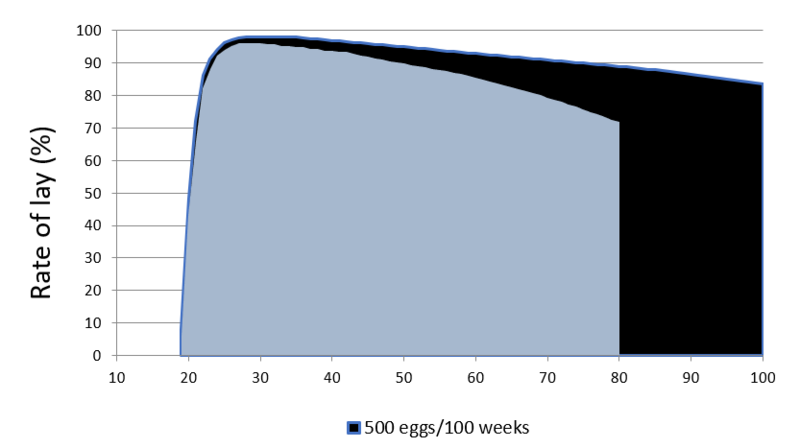 At 90 weeks a layer will have produced a total egg mass equivalent to more than 13 times its own body weight! The biggest risk for layer liver health in longer production cycles is Hepatic steatosis, or what’s known as fatty liver. Fatty liver is the the accumulation of lipids in the liver. In wild animals, this accumulation is a physiological adaptation to energy needs in particular situations such as migration and hibernation. Signs of fatty liver include overweight birds with excess of abdominal fat, pale combs and wattles, decrease in egg production, and increased mortality. At post-mortem, the liver will appear enlarged and with soft texture, with the liver turning a yellowish color due to excess fat storage. Post-mortem can also reveal liver hemorrhages, from petechiae to rupture of liver capsule. The negative effects of fatty liver include low production, mortality, poor egg shell quality, and high feed conversion rates. A fatty liver is in malfunction, then storage and mobilization of triglycerides to yolk fat and formation of transport molecules are affected, and as a result, the birds will decrease their egg laying rate. In addition, because the liver is not able to metabolize vitamin D properly, egg shell quality will decrease. Egg shell quality deteriorates when the liver is less efficient in activating vitamin D3 which is necessary for calcium transportation to the egg gland. First, it is important to develop a large framed, strong, and lean pullet. Investing effort in this growth stage will pay off for future performance in a number of areas, not only liver health. In the production stage, it is essential to keep a balance between energy intake and energy requirements. At the onset of lay, reaching the correct bodyweight is key and it is recommended to use a feed with higher ME if needed (depending on feed intake). After reaching adult bodyweight, the target is to keep a stable bodyweight. Fat birds will result in higher maintenance and higher production cost and will be more susceptible to develop fatty liver. In this stage, use feed with lower ME level at the end of the laying period with a higher fiber content up to 6% (oat hulls, sunflower seed). During the production period, it is essential to measure bodyweight frequently and monitor feed intake. To maintain a healthy liver, one needs to consider the energy sources in the birds’ feed. Replacing dietary carbohydrates with supplemental fat, while not increasing the energy content of the diet is helpful in maintaining a healthy liver. Feed should also include suitable levels of lipotropic factors like choline, vitamin B12, B1, folic acid, and vitamin E. Lipotropic nutrients help to catalyze the break down of fat during metabolism in the body and prevent excess fat buildup in the liver. Choline is highly effective and present in a wide variety of raw materials, such as soybean meal and rapeseed meal, but supplementary choline is always beneficial for the birds in production. The rule of thumb for added choline is to provide a minimum of 250 ppm in rearing, and between 500 and 1000 ppm in production. Properly balanced amino acid nutrition is also important to preventing fatty liver. Amino acids are necessary for fatty acid transport to adipose tissue. 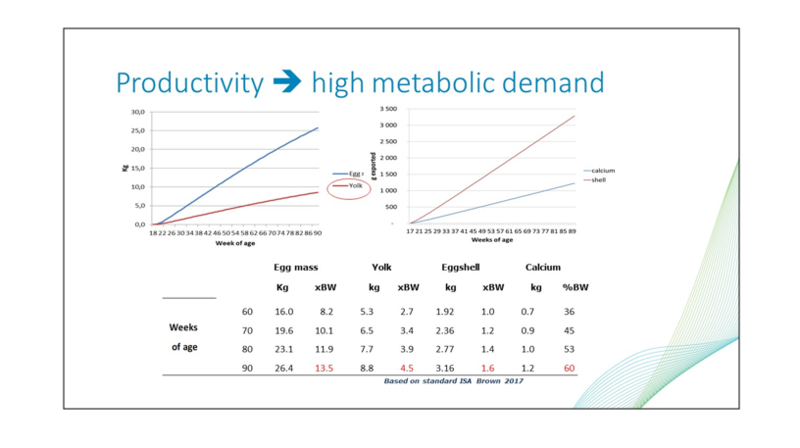 Keep in mind that egg mass, rather than age, is the driving factor when it comes to amino acid requirements. When looking at the amino acid requirements, be sure to consider flock uniformity and use a higher safety margin (+5% to 10%) if flocks are not perfectly uniform to ensure the requirements of the best performing birds are being met. 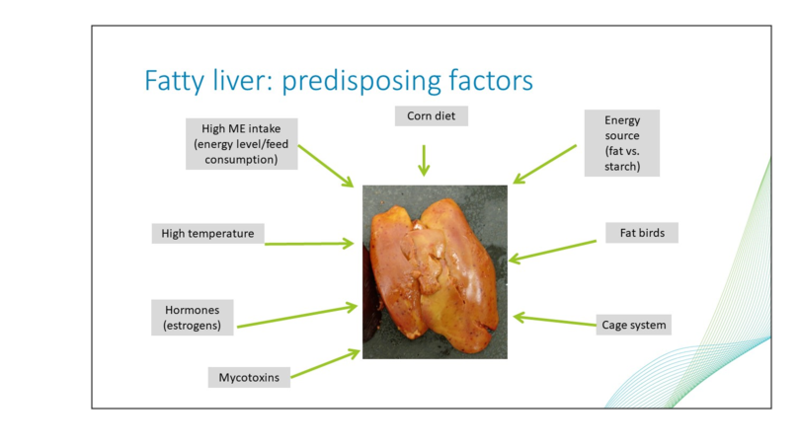 In summary, careful observation and control of flock bodyweight is key for fatty liver prevention. Suitable nutritional strategies and supplementation with lipotropic agents can be helpful to keep a healthy functional liver. If you are considering extending the production cycle of your birds, or if you are already working with a lengthened cycle, be sure to monitor some of these key elements of liver function for the benefit of the health of your birds.